Meet another one of Brooklyn’s many talents, Leapling, if you haven’t already. 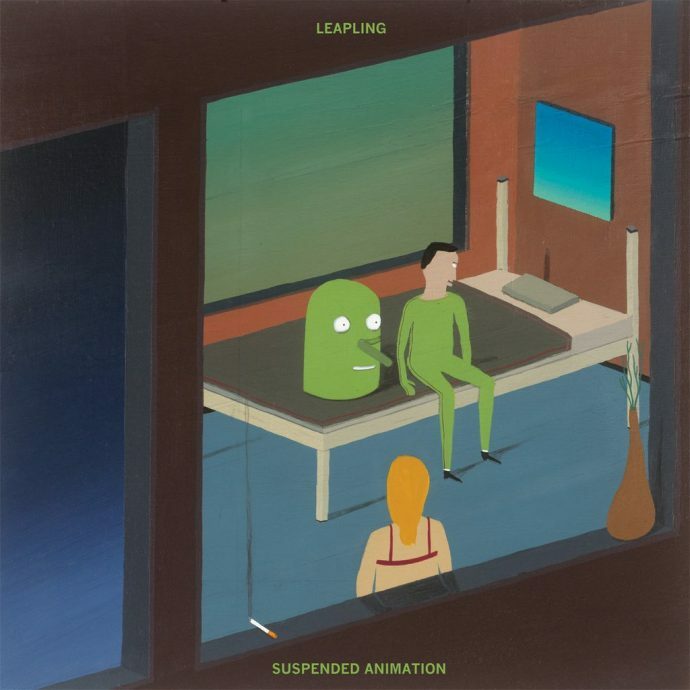 Their third release entitled Suspended Animation appears to be written and produced entirely by guitarist/vocalist Dan Arnes, while their debut release, Losing Face EP, was written and performed as a quartet. This record, as a whole, is rather unremarkable. This may sound like a negative statement, but it’s not. What I mean is that it’s merely average. You can coast through this record given a mild distraction to occupy your conscious mind, and come out the other side not having an opinion on the album either way. Which is exactly how I listened to this record at first. I wasn’t naturally encapsulated by it, rather I found I had to drag myself back into the mix in order to actually listen to it. Normally, I would’ve just kept coasting, but as it is my job to actually listen, I forced myself to dig a little deeper. The first thing I noticed was Dan Arnes’s voice. The vocals were quite reminiscent of Death Cab For Cutie’s Ben Gibbard. While not traditionally powerful (at least not in the sense of volume or force), Arnes’s voice has this natural smoothness that can be equally dark or sweet depending on the context. The vocals are certainly the strongest gear in this machine, and while they initially piqued my interest, they couldn’t hold it alone. The following tracks felt too repetitive. There’s often these subtle nuances in music; these slight variations that we, as listeners, often take for granted. A key change here or a different transition there, there’s often something new or different that renews our subconscious interest in something as naturally repetitive as music. And that is exactly what this album lacks. Take the record’s third track “Don’t Move Too Fast,” for instance. There is this interesting studio effect on the drums called phasing which gives the snare a unique, atmospheric sound. This would appear to be one of the aforementioned nuances, and you would be absolutely right to think so, except in the way that this track uses it. The phasing continues to sit in the drum track’s effect series throughout the entire song, so there is no contrast within the song itself. By simply removing the effect during the choruses, the kick and snare could regain their full power and recapture the listener’s interest. Most of my criticism’s fall somewhere in the job description of the producer, which also happens to be Dan Arnes. I won’t pretend to know everything about modern music making practices, but I’ve found that self-producing rarely tends to bring about the desired results. One mind has a hand in every step of the process. From writing, to composing, to recording, to producing, to mixing, and so on to the point that it becomes almost unhealthy for the album. This is, of course, not the case for all albums/ artists that utilize this workflow, but, generally speaking, two heads are better than one. Anyway, with a third party producer this record could’ve been amazing. I could list all my many ideas for how I think this record could be improved, and there’s no way of telling whether I’m “right” or not. And that’s the point. Whether I’m right or wrong doesn’t matter. What matters is that my views and ideas are different, and that’s what this record needs: perspective.